An entrance to a Hunting Grounds dungeon. 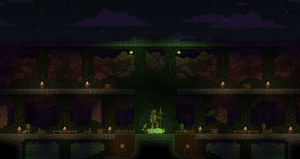 Floran Hunting Grounds are a Floran themed dungeon made up of an overgrown structure, mostly underground and patrolled by hostile Floran guards. It has significantly more light than a canyon dungeon, and has more structure and windows inside. It was one of the earliest dungeons, playable through most of beta. The entrance is often a large guarded building with a Large Floran Statue near the tunnel to the dungeon below. If enough tagged dungeon objects are placed together with a Colony Deed a unique Floran guard can be summoned. These guards resemble the hunters inside the Ceremonial Hunting Caverns. See the floranhuntinggrounds tag detail page for a complete listing of tagged objects. Arrow Etched Rocks Decorative 70 Very helpful rocks. Or could the arrow be a trick? Crooked Pike Railing Decorative 50 A railing made of pikes tied together. Empty Plaque Decorative 40 An empty plaque. What belongs here? Floran Champion Statue Decorative 300 A statue of a Floran. It looks like a great hunter. Ixoling Pike Decorative 300 A small insectile creature impaled on a hunting pike. Mossy Packed Dirt Block 0 Packed dirt, covered in moss. Rock Bricks Block 0 A crudely produced set of rock bricks. Shield Mounted Skull Decorative 50 A finely carved plaque with a skull on display. Web Rack Decorative 200 This trophy rack is covered in a foul web. Wicker Block 0 A roughly woven wicker material.